Approximately, two in three Australians will be diagnosed with skin cancer by the time they are 70. Melanoma is the most deadly form of skin cancer and is 3-4x more common in Australia compared to the US and UK. Diagnosed early, treatment is simple, inexpensive and curative, despite this, it remains the leading cause of cancer death in young people (20-39yrs). Skin cancer screening guidelines are inconsistent and rely on subjective methods that have failed to reduce the mortality rate. Up to 1 in 6 melanomas are misdiagnosed, giving the cancer time to spread, before proper treatment is given. 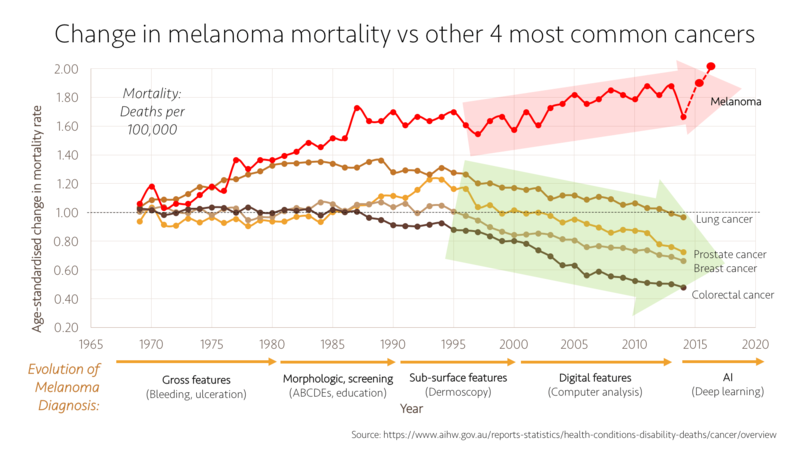 There are currently no specific blood tests available to diagnose or monitor melanoma and unlike most other cancer types, the mortality rate has INCREASED by 33% since the 1980s and doubled since the ’60s. Finally, over A$900 million is spent on skin cancer procedures and treatment every year, more than any other cancer type. Melaseq™ is a new internal approach to detecting melanoma. The test is being developed as a genomic blood-test which will assist doctors to diagnose and monitor melanoma more accurately and objectively. The test measures 38 circulating microRNAs, which are a recently-discovered class of genes that have key functionality both inside and outside of cells. The ability to detect microRNAs in disease-specific combinations makes them ideal candidates for differentiating between healthy and cancerous states. As the secretion of microRNA-rich exosomes into the microenvironment and blood supply is one of the first steps in melanoma development, Melaseq is uniquely able to detect the disease in its earliest and most curable stage. Geneseq Biosciences believe that by incorporating a molecular biomarker of melanoma such as Melaseq with existing imaging and histopathology techniques, doctors will be able to more accurately diagnose melanoma, with fewer unnecessary, costly and sometimes disfiguring, biopsies. We are optimistic that the test will reduce both over-diagnosis and eventually slow the rising mortality rate of this melanoma. In addition to its diagnostic potential, Melaseq may also be useful for measuring response to surgical excision or treatments such as immunotherapy, predicting a patients prognosis/outcome and even as an early sign of disease recurrence.